My little sister is having twins in December! She already has 2 girls and this will be girls 3 and 4. We're so excited! I love creating thank you cards for new moms. I used Itty Bitty Welcoming Committee for these cards. I love that the image is so large it takes the guesswork out of designing the card-front. When I create multiples of the same set, I usually do it very systematically. First, stamp and color all images, then die-cut them. Next, figure out what to do with them. It's not usually all planned out! The best decision I did make was to frame out the focal image with the Hooray wreath. I snipped the word hooray out and placed it onto a piece of grey cardstock. 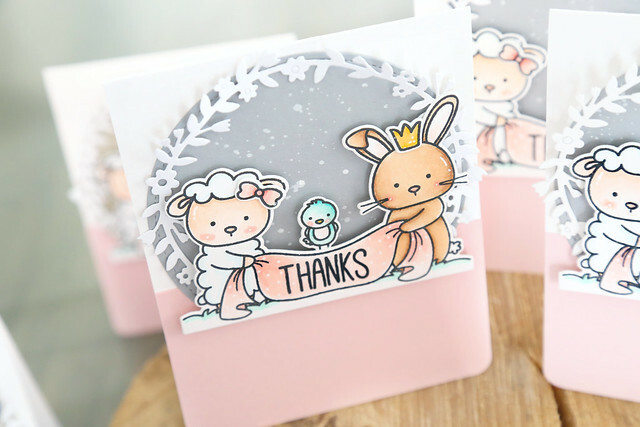 I splattered some white ink onto the grey circle to give it a dreamy quality and added some pink to the bottom half of each card to make sure that the set looked girly enough for my sister and her soon-to-be-FOUR girls.